This trip fulfills a dream to be in pure wildness. We started in Anchorage the main city of Alaska (trade). Our goal was to see grissly bears and camp as much in a primitive way, this goal was totally succeeded! The high lights where Denali NP and Denali HWY. 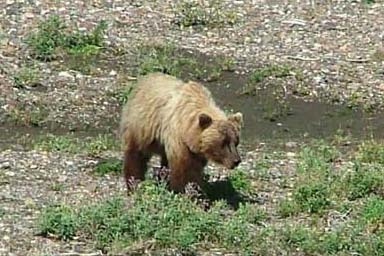 Denali NP offers a real wildness experience. You Can enter the park by shuttle bus and taking your bike with you (2 bikes/bus) to one of the bus stops in the park. The park road is a dead end of 128km dirt road. On this road several campsites are build. On these campsites a maximum of about 7 tents are alowed. 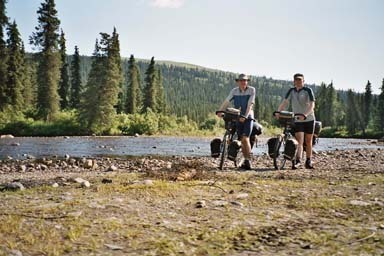 Some places the campsites do not allow motorised vihicles so you arte there with hikers and bikers. Facilities like shops are not there only a toilet and a shed to store your food to prevent the bears eating your meal. So you have to bring all your food/Water your self. Therefore the right equipment is essential (see: general outdoor). In the park you can see caribou, wolfs, grissly bears, moose, we have seen lots of caribou, a 5 grissly bears even a mother with a cub, and a few moose. 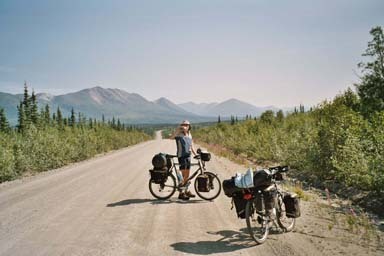 The other high light was Denali HWY the former entering road to the National Park. It is called a highway but actually is is a dirt road of 217 km(135 mile). The road goes from west to east (Cantwell to Paxton). This road is often overlooked by many motorists which result in 2 car per hour. So compared with the National Park is is much quiter and offers also a very you chance to view wildlife. The scenery near Cantwell can contain a glimp of Mnt McKinley and certainly alot of glaciers + rivers. Along this road you must be self supporting (spares, food, selter ectra). Only at Gracious House (52 mile from Cantwell) and Maclaren River lodge (93 mile form Cantwell you can by a meal). Gracious House is a pleasant place. Cantwell is a good place to stock up, Paxton makes you only happy with stone age muffins and petrol. Wildcamping is alowed without permit but there are three no facility campsites along the Denali Hwy with waterpump and toilets. Alaska is a fantastic place to explore!